This is written by Andrew Hoffman. He is a freelance writer and journalist from Los Angeles, CA. In addition to writing on various topics of interest (including turquoise jewelry and physical fitness), he enjoys working out, surfing in Santa Monica, and collecting classic, first-edition novels. You can get in touch with him over here . The handmade production of Native American jewelry is a celebrated tradition with profound cultural significance. If you have ever beheld or owned authentic Native American jewelry, you surely understand the beauty and the intricacy of the production process, but you may not be aware of the immense work that goes into it. From bracelets to earrings to bolos, every piece of jewelry tells a story, and it may surprise you to learn just how elaborate a process is involved in bringing its unparalleled beauty to life. Prior to the arrival of European settlers, Native Americans would hammer and etch copper and other base materials into various forms of jewelry. Some stones, like turquoise, are believed to have been cultivated and crafted as far back as 200 B.C. As Europeans made their way into the New World, the natives began incorporating new materials and techniques into their handmade production processes. With the help of Mexican and Spanish silversmiths, the natives learned the art of silversmithing and metalwork, and started working with glass beads and other fine materials previously undiscovered in the Americas. Suddenly the jewelry became more elaborate, and the processes more diverse. The Spanish horse bridal became the inspiration for the squash bottom necklace, and heishi jewelry was crafted using a variety of beads and stones. There are countless processes for producing handmade Native American jewelry. For example, heishi jewelry is often made by smoothing individual seashells against a stone wheel, and stringing individual slices together using a fine wire. 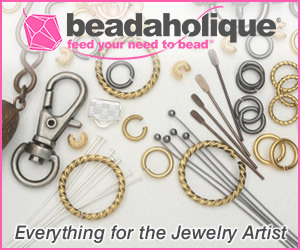 Heishi beads remain extremely valuable due to the complexity involved in their construction. 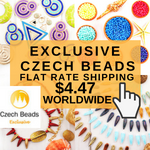 These beads must be individually cut, drilled and ground, and a single necklace may consist of hundreds of individually crafted beads. 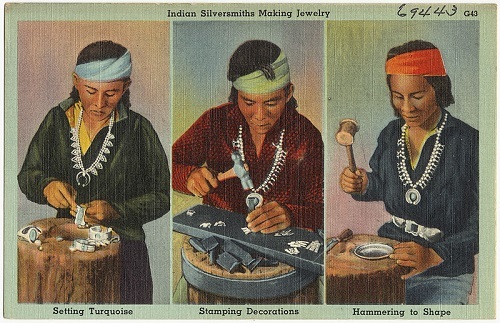 Silver jewelry -- popular among the Navajo -- was far more difficult to make. The Navajo would often melt down silver coins and fashion them into concha-type jewelry (concha belts, rings, and more). Talented silversmiths would use files to hammer intricate designs onto the silver, thereby establishing a sense of beauty and contrast that is still coveted by jewelry collectors today. The Hopi Indian silversmiths were especially industrious, and would use an overlay technique to create elaborate designs, before encrusting them with assorted jewels. The overlay technique was actually quite ingenious for the time, and involved sawing the design into a single sheet of silver and subsequently overlaying it onto a second sheet for soldering. The background would then be oxidized with the top layer for a polished, textured appearance. 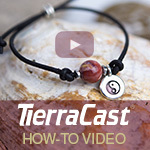 Overlay techniques remain popular in jewelry making. Feathers were also commonly found, on beaded jewelry in particular. Feathers would be strung alongside turquoise and other beads and hung in various locations, when not fashioned as part of necklaces, earrings and other accessories. Feathers are symbolically very important in Native American culture, reinforcing the belief that all natural things within the universe contain a soul or a spirit. This doctrine, known as animism, is essential to Native American life, and a reminder that all things possess an inherent value and wisdom. Modern production processes have made it easier to replicate the look of handmade Native American jewelry, so how can you tell the real from the fake? For starters, look for an authentic artist hallmark. 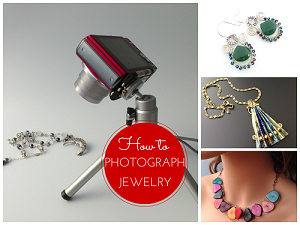 Most modern handmade jewelry contains the signature -- or hallmark -- of the artist. Also, if you’re dealing with sterling silver, check to see that the silver is in fact sterling, by holding it up to a magnet. True sterling silver (commonly used in Native American jewelry making) is not magnetized, so that can also serve as an important telltale sign. If you’re dealing with turquoise jewelry, find out if the turquoise is stabilized or natural. By U.S. law, turquoise stones must provide a written indication of whether the turquoise is stabilized or natural. 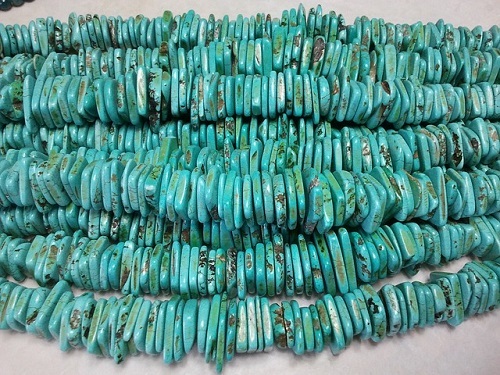 Natural turquoise is more valuable, and is more commonly used in authentic Native American jewelry making. Finally, just do your homework. 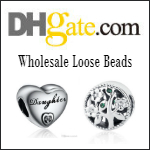 Find out where your jewelry is coming from, read reviews, and learn about the seller, and don’t be afraid to ask questions. Yes, there may be a bit of guesswork involved, but the more you learn about the jewelry you’re purchasing, the more educated a guess you can make. Featured handmade Native American jewelry designs courtesy of Southwest Silver Gallery. Very good post Pearl. I enjoyed it very much. 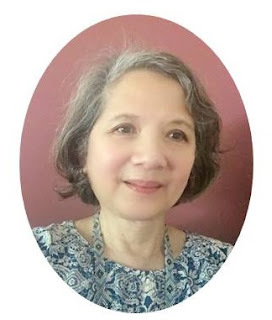 Thank you for all of your hard work on this blog. It is part of my morning routine! I wish you a Merry Christmas and happy holiday season. I absolutely love Native American Jewelry. Especially the turquoise and silver work!! 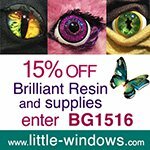 It feels like a magnet to me - I must go and drool over the beautiful designs and craftsmanship!